Browse: Home » 2018 » November » Wadi Qana: the ‘Natural Reserve Zone’ that can only be built on by Zionists. This morning IWPS joined Riziq – a poet, activist, and farmer from Deir Istiya known by most local Palestinians and internationals in this area – for a walk. We went to a place close to Riziq’s heart, Wadi Qana. IWPS has written about Wadi Qana before (http://iwps.info/2016/06/iwps-returns-to-deir-istiya/). It is a luscious area of land – 15,000 dunams and half the agricultural land of Deir Istiya – and is an important recreational site for the community. Palestinians have lived in and owned land in Wadi Qana for generations. 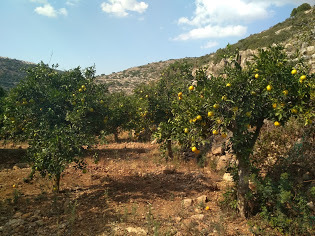 It is a beautiful place full of natural water springs and trees bearing different types of citrus fruit. Now the entire rim of the valley is covered with 9 settlements, which adorn almost every hilltop. A year and a half ago, an Israeli court judgement ordered that all settlement building should stop pending the outcome of a court case that was brought by Palestinians about Wadi Qana. Since then, 70 settler houses have been built, in direct contravention of this ruling. 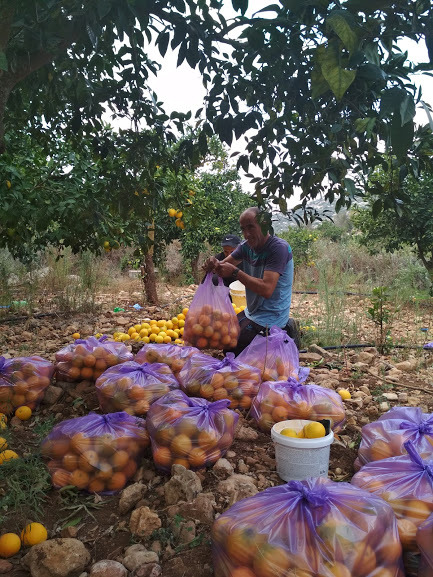 IWPS has visited Wadi Qana before – Riziq usually takes us to see the area and the effect that the surrounding settlements have on the land and the farmers’ ability to harvest their crops. Today we saw damage to one farmers’ trees caused by excessive light from a settlement ‘security’ light and chemicals sprayed onto the agricultural road. We saw a water pipe which previously connected a water source to Palestinian farmland that has been destroyed by settlers. At the same time, electricity, water and sewage pipes run through the Wadi into the surrounding settlements. Palestinians cannot access these. 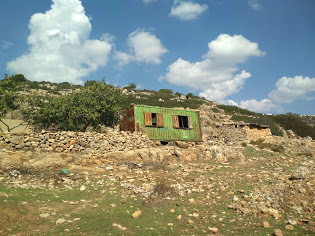 There is a history of vandalism to Palestinian property in the Wadi. The area was taken over by Israeli authorities and numerous trees were destroyed. Israeli authorities declared the area to be a ‘Natural Reserve Zone’. The effect of this is to prohibit Palestinians from building on the land, altering structures on the land, planting new crops or having animals on the land. Last year, IWPS activists, Palestinians and others joined Riziq as he attempted to stay in a cave in the Wadi along with 60 of his goats. 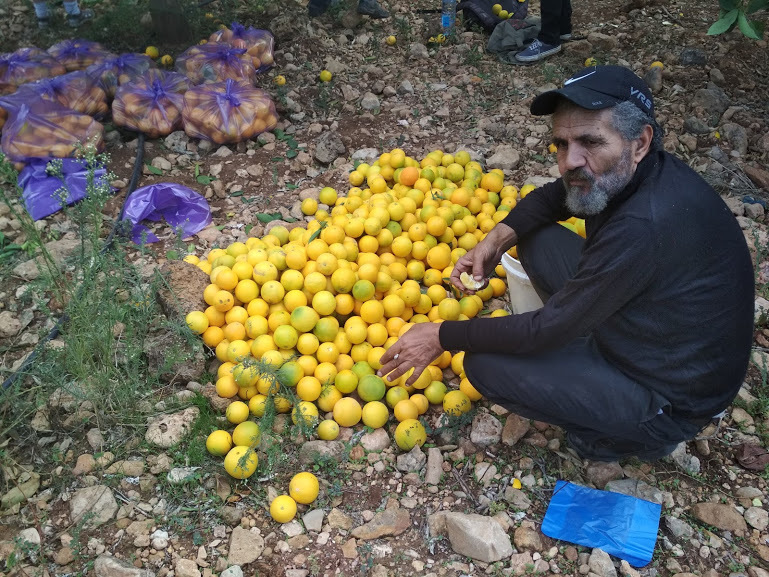 Riziq managed to stay in the Wadi from October 2017 – February 2018, but was eventually forced out by the Israeli army. He had 15 goats stolen by settlers in the meantime. This picture shows a metal container that a farmer lived in after his house in the Wadi was demolished by the army. A Shepherd’s Respite. Israel does not allow anyone to live in the Wadi Qana. He was born in the Wadi and built a house to spend some nights there in the summer months. His house was demolished and he was only allowed to have the temporary structure of the metal container. He was then instructed to change the paint on the outside of the container, which was originally red, so that it would not ruin the view of the Wadi from the settlement. Pretending that Palestinian farmers don’t exist seems to be a key thing for the settlers in this area. Every year they hold a 3-day celebration in the Wadi, ‘Wadi Qana day’, during which time Palestinians are blocked from entering the Wadi. The Wadi is a ‘Natural Reserve Zone’ for Palestinians. 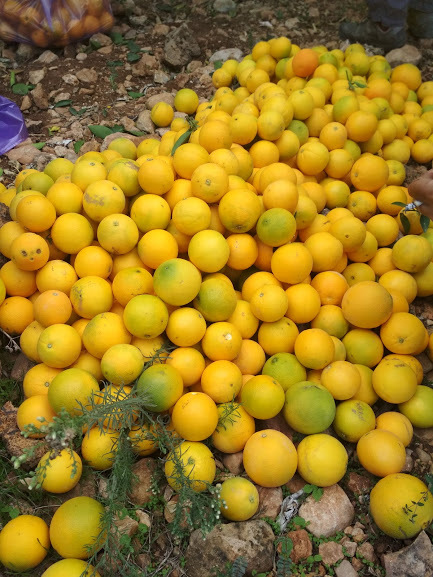 Yet as we sit under some beautiful orange and grapefruit trees, two expensive cars pull up and 3 Israeli men get out. They have smart clothes, expensive cars, and maps. They walk near to Riziq’s cave, and start pointing in the distance. They are in between two hills, both containing settlements, and they are planning something. Riziq catches the word ‘contractors’ in Hebrew. He suspects they are planning a new settlement road through the Wadi. 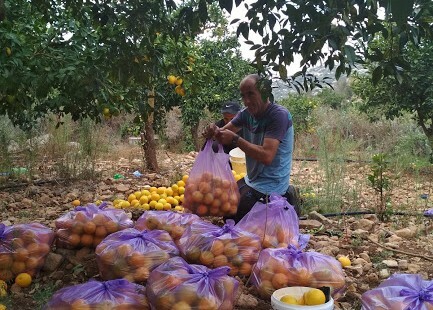 Palestinians cannot alter or improve their land in the Wadi, but Israelis continue to expand and adapt the settlements, in contravention of Israel’s own law, completely undeterred. Despite this, Palestinians continue to try to harvest their land and enjoy the beautiful scenery of the Wadi. 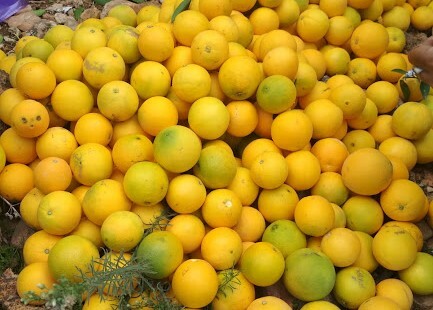 We were invited for tea and oranges by Awni, who along with his family was harvesting oranges to sell in a local market. We were offered orange after orange, water and tea. Whilst we were talking, we were joined by three men from Deir Istiya, the local village, who were enjoying a day off work to relax in Wadi Qana. It was great to experience the surroundings with Palestinian hospitality and to see others doing the same.